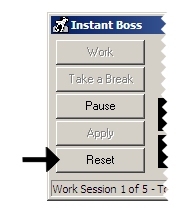 Instant Boss will time your work/break cycles, reminding you when to work and when to take a break. The defaults are 10 minutes of work, 2 minutes of break, and this is repeated 5 times for a total of 1 hour. 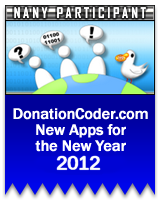 These values can be changed to suit your needs. Instant Boss will remember the values you used during your last session. The first box is for how long you want to work. The second box is for how long you want your breaks. The third box is for how many times you want to repeat this cycle. Click Apply to set the new values. In the statusbar you can see where in your work cycle you are, followed by how long you have worked this session, followed by how long you have worked since you started using Instant Boss. 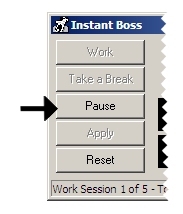 Instant Boss will tell you when it is time to take a break. You will have the choice to keep working a little longer, take your break now, or skip your break and begin next work period. If you decide to take a break now, it will begin your break period. If you decide to work a little longer, it will count up and add this to your total work time. You can then decide when to take a break by clicking the take a break button. If you decide to skip your break, it will begin the next word period in the cycle. At the end of your break period, you will be told to get back to work and offered a few choices. If you decide to work, the work timer will begin. If you decide to take a longer break, it will extend your break by 50%, and remind you again when your time is up, to get back to work. If you click cancel, you will have to start work manually by clicking the work button again. There is a pause button in case you are interrupted by phone calls or other things that need your attention. This can be used during both work or break periods. The reset button...use with caution. This will stop all timers and reset everything to default values of 10-2-5 so that you may begin again. 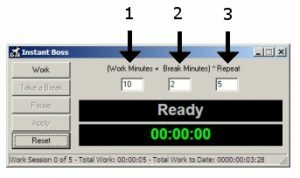 It will not reset how long you have worked today, nor the total time you have worked since you started using the Instant Boss program. Clicking the X to close the program will result in it being minimized to the system tray. The only way to exit is through the right click menu on the tray icon. All of the button options also appear on that menu. For power users, there are command line parameters you can use to preset the values when you run Instant Boss. You can either use this from the Windows Run dialog or use it as shortcut targets. The numbers correspond with work-break-repeat, in that order. Please use only numbers, no letters. 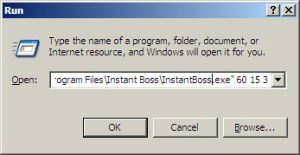 Instant Boss just saved my day.